Clear with Gold Bottom Insert, 2 Piece Candy Boxes, 8.25x1.25x1.25"
These 2-piece boxes have gold insert to add visual interest. Holds 5-6 truffles. Great for wedding favors! Actual box dimensions are: 8-3/16" L x 1-5/16" W x 1-3/16" H. These boxes comply with FDA regulations for direct food packaging! Add a Custom Printed Label! Add Stretch Loops to Your Boxes! Our clear truffle and candy boxes are perfect for wedding favors, baby shower gifts and everyday packaging in your store. Our clear boxes are perfect when you want all the focus on your beautiful truffles! We offer these boxes in a small size that is perfect for 1 truffle or macaron, all the way up to a large size that can hold 12 truffles! 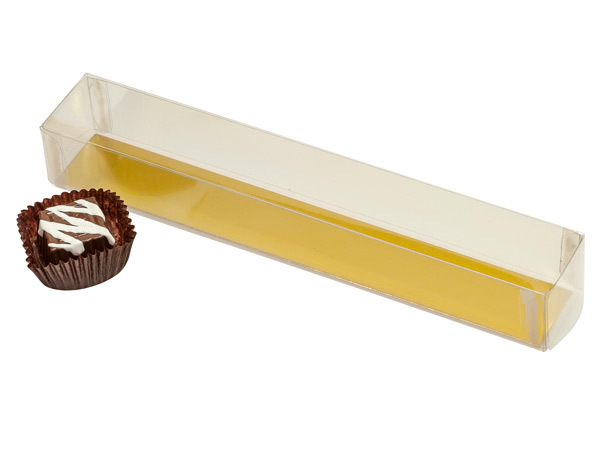 Choose the gold accented boxes when you want to add an elegant accent to your chocolates! We have choices ranging from a gold bottom insert, a gold border along the top edge that creates a window effect or even a gold side print! We have sizes made for 2 truffles all the way up to 6 and 12 truffles! If dramatic and eye catching boxes are what you are looking for, choose our black bordered boxes! These boxes will draw attention and have a sleek appearance!